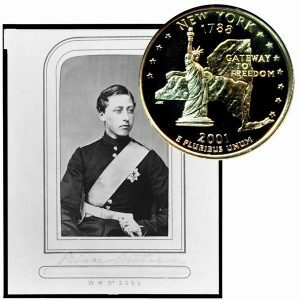 Today, the New York State Quarter Coin remembers when Prince Arthur arrived in the city on January 21, 1870. Some Facts Concerning the Royal Scion—His Nose and Feet—The Flunkies and Toadies. H. R. H. Arthur, W. P. A. Guelph, K. G.. arrived in New York yesterday direct from Montreal. This fortunate young man, whose voluminous name is announced with a tail at both ends, is the third son and seventh child of the Queen of Great Britain, and is therefore accorded a position of prominence in the world. He was born on the 1st day of May, 1850. He is a graduate of the military academy at Woolwich, and is a lieutenant in the regiment of Lord Alexander George Russell, stationed in Canada. He came out last fall to join his regiment, accompanied by a retinue suitable for a Prince. The expense of transporting this young lieutenant to his regiment was £73,000, the bills for which, when presented to the Chancellor of the Exchequer, were promptly repudiated, the honest, burly old peer remarking that if the young man chose to travel in royal state he might foot his own bills. Whether the little account has yet been settled or not has not been ascertained. Mrs. Guelph, however, is reported to be a wealthy woman, and is undoubtedly able to pay the little travelling expenses of her minor children. Through the courtesy of Commodore Vanderbilt this scion of British royalty has travelled thus far in the United States in regal splendor, though merely at the cost of first-class tickets for himself and suite. The Commodore sent his private car to Montreal expressly for the use of the young man. In this princely conveyance H. R. H. found everything that even royalty could demand, as appears from the fact that he rode the entire distance from Montreal to New York, occupying twenty-two hours’ time, without once leaving the car. At St. Albans supper was served him in the car, and at Troy, breakfast. Arthur’s suite comprises Colonel the Hon. John Frederick Elphinstone, Lieutenant-Colonel of the Scots Fusilier Guards, who accompanies him in the capacity of Governor; Lieutenant Picard, of the Horse Artillery, equerry, or master of the horse, or superintendent of transportation; Lieutenant Fitzroy, of the Rifle Brigade, aide-de-camp or private secretary; a valet; two gentlemen in liveries, vulgarly termed lackeys; and a police officer. The valet of the Prince is a gentleman by birth and education, as his manner, dress, and carriage betoken, although our reporter was unfortunate in not learning his name. He very closely resembles, in figure and style, some gentlemen by birth and education of this city. In fact he is a nobby young man, with a penchant for French airs rather than those of merry old England. American curiosity asserted itself on the arrival of this party at the Thirteenth street station of the Hudson River Railroad New York, soon after noon yesterday, where a crowd of several hundred men and women were assembled to gaze at them. These, however, were held in pretty fair subjection by the police during the alighting of the royal party. Mr. Edward Thornton, the British Minister at Washington, and his secretary, met them at the depot. They immediately entered carriages that were in waiting, and drove rapidly to the Brevoort House, a few men in the crowd shouting after them, and two or three ladles waving handkerchiefs. Entering the Brevoort House, he was met by Walt, the proprietor, who bade him welcome. The Prince bowed his thanks, and went up to the apartments prepared for him. Mr. Archibald, the British Consul, sent round at 2:30 two quick travelling carriages, and the party sallied forth to see the glories of the world-celebrated Central Park. The carriage passed out of the Park about 4 o’clock and passed down Fifth avenue, and pulled up at the Brevoort House at 4:30. Immediately after dinner the Prince and party started on foot for Wallack’s Theatre precisely at six and a half minutes to eight. Alongside of the Prince sat Mr. Archibald, British Consul, who looked as if he had been cut out of a cheese-paring; Mr. Thornton, the British Minister, with his usual gooseberry-fool expression; and Mr. Trench, a son of the Earl of Clancarty, and attaché of the British Legation. During the evening the Prince gave unequivocal expressions of his admiration of Mr. Wallack’s acting, and at the moonlight march broke out sympathetically into expressions of enthusiasm. Mr. Richelieu Robinson, one of the Fenian head-centres, was in the audience, but the Prince was not molested. The audience slowly departed from the theatre, all seemingly reluctant to move farther than the inner doorway, until they had a nearer view of the Prince, who, seeing that they were determined to await his departure, finally, with his suite, worked his way to the door. The Prince looked, and immediately thereafter the cheers were again proposed, and they were given with a will. Arthur raised his hat. He then departed, escorted by Captain Hedden with a small squad of police and detectives, who surrounded the royal party, followed by a crowd. The New York State Quarter Coin shows with an image of Prince Arthur, circa 1865.